Seattle has been bleeding Section 8 tenants for years. But now, as rents skyrocket, even the county’s smaller towns are pricing out tenants who need affordable housing. “What we’re seeing now is this ripple effect,” said a Seattle Housing Authority spokeswoman. On a recent Saturday morning, Elmika James settled into a couch inside the subsidized, three-bedroom apartment she fears she could soon lose and began searching for a new home. She scoured housing websites on her phone, looking over listings friendly to participants in the federal Housing Choice voucher program, otherwise known as Section 8. Many of the listings were old, the apartments advertised already rented. Others were scams. Some property managers have told her flatly they did not accept the vouchers at all. The Housing Choice Voucher Program provides funds from the U.S. Department of Housing and Urban Development to help poor, elderly and disabled renters pay for housing. Managed by local public-housing authorities, the program provides renters with payment vouchers they can use to secure privately owned housing. Each voucher is good for a portion of the tenant’s monthly rent, and is paid by the housing authorities directly to the landlords during the life of each lease. James, a 43-year-old UPS package handler and mother of five, said rejection has become part of her daily routine. As the housing market skyrockets, many of the region’s poorest tenants are struggling — and competing — to find homes they can afford. For James, cities like Seattle, where rents are higher than they’ve ever been, seem out of reach. “There just doesn’t seem to be anything there for me,” she said. The Seattle Housing Authority manages 10,000 vouchers and remains the largest program in the county. But the city has been bleeding Section 8 tenants for years as families move elsewhere in King County and the region. Voucher holders are not bound by geography. Anyone lucky enough to obtain one, usually by lottery or after a waiting period, is free to transfer to another jurisdiction. 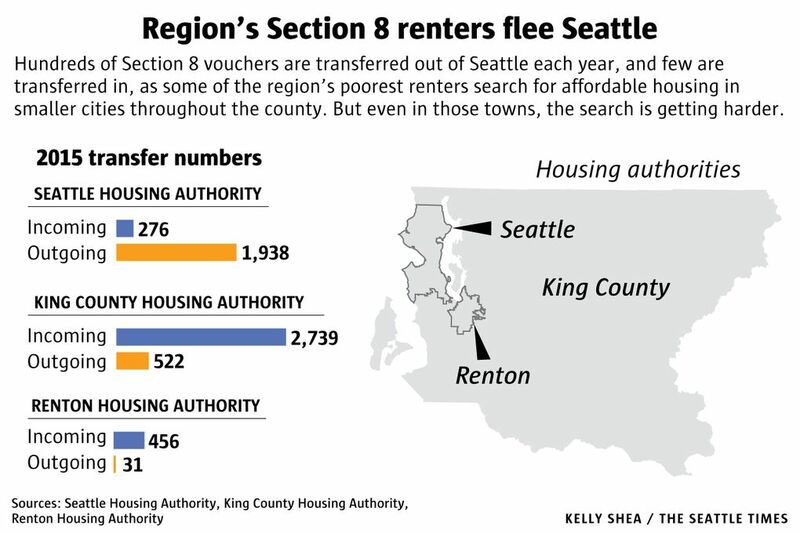 In 2011, 1,770 Section 8 tenants transferred their vouchers from Seattle to another jurisdiction, according to figures obtained by The Seattle Times. The total in 2015 was 1,938. Meanwhile, the number of transfers into Seattle has plummeted, dropping from 460 in 2011 to 276 last year. In King County, the trend is moving in the opposite direction as tenants look to the suburbs for a reprieve. In 2011, 2,396 Section 8 tenants transferred their vouchers to the King County Housing Authority. In 2015, a total of 2,739 tenants arrived. Less clear is how much housing is available to voucher holders. None of the county’s three housing authorities tracks the raw number of houses and apartment units operated by participating landlords. But Seattle Housing Authority spokeswoman Kerry Coughlin acknowledged that the supply does not appear to have kept up with demand. In Renton, where James’ voucher obliges her to search, the wave may have finally breached the city’s borders. Section 8 tenants transfer their vouchers for a variety of reasons, but those who have chosen Renton have done so in part because rents in South King County have traditionally lagged behind, said Jill Richardson, who manages operations for the Renton Housing Authority. But Renton is catching up. Its average three-bedroom apartment goes for $1,809 a month, according to Dupre + Scott Apartment Advisors. That’s just behind the $1,950 countywide average. As recently as summer, voucher holders were “flooding” to Renton in search of housing, Richardson said. As of November, the number of transfers into the authority so far this year reached 489, up from the 452 recorded in 2014. “And then rents went up,” she said. The combination of increasing rents and more housing seekers has hit the tenants of Renton Woods particularly hard. 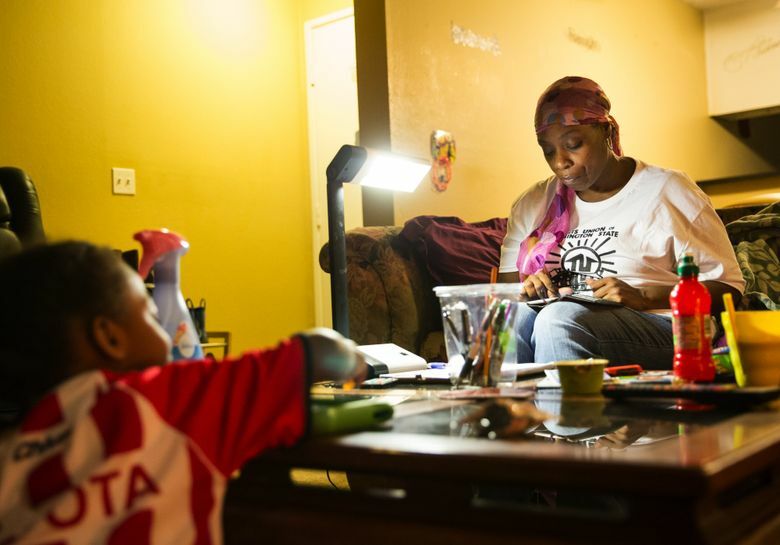 Elmika James had only held a voucher for a year when she and dozens of other Section 8 tenants in Renton were informed at the end of August that their leases would not be renewed. A notice taped to James’ front door told her she had just 60 days to move out. 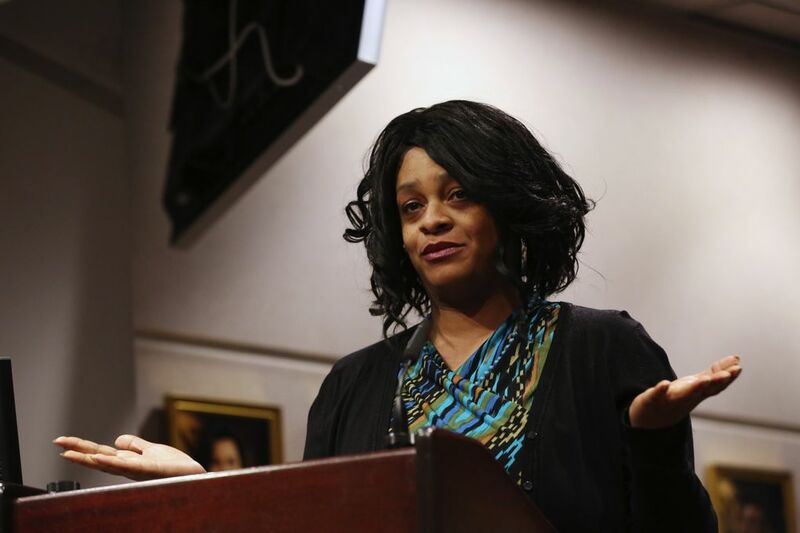 After threats by the Northwest Justice Project of a housing-discrimination suit, and scrutiny by Renton city officials, the company that manages the Renton Woods complex where James makes her home backtracked. Attorney Scott Crain, who represented James and several other tenants, said the company agreed to extend the move-out deadlines in early November, then later dropped the move-out deadline altogether. Her situation is secure for now, but James said she still fears she could lose her $1,342-a-month apartment, and will continue to search for other options. Toya Thomas, a Renton Woods tenant of five years, has held a voucher for the past 12. Like other voucher holders, she has bounced around the county. She previously lived in Des Moines and Seattle before settling at Renton Woods. At the time it was known as Renton Heights, and it was owned by a company much friendlier to Section 8 renters, Thomas said. Like other complexes in the area, Renton Woods has passed from one owner to another as property values increase. Its current owner, New York-based Abacus Capitol Group, bought the apartment complex in 2015 for $40.5 million, according to property records. The company and its property manager have not returned calls requesting comment. Thomas’ own search for a new home began the day the notice appeared on her door in August. So far she’s been unsuccessful. As the now-canceled move-out deadline neared, she applied to transfer her voucher to King County. And she’s now hoping for a better result. So is Elmika James, who said she’d like to find a duplex or private home. Or maybe just something nearer downtown Renton and a Metro bus line to help ease her 19-year-old son’s daily commute to Seattle Central College. The closest stop is a mile away by foot. She thought she’d found a potential replacement in September, but lost it because she couldn’t afford the $1,500 deposit required by the landlord. A few weeks later came a lead about a complex in Renton that rents to voucher holders, but she abandoned the pursuit after a friend who had already toured the complex warned her about its condition. Now she’s back to square one. Thomas said she has faith the process will eventually work in her favor. “It would be nice if it proved me right,” she said. Vernal Coleman: 206-464-3304 or vcoleman@seattletimes.com. On Twitter @vernalcoleman.